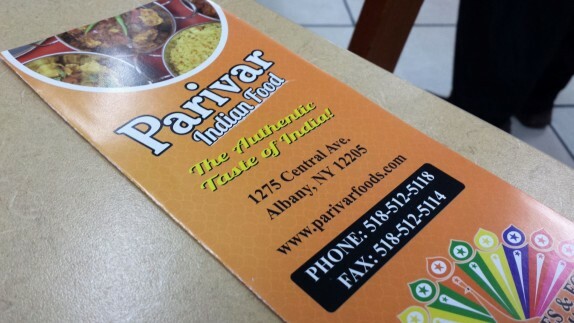 I’m very keen on the eats at Parivar in Albany. You can see everything I had to say about it almost 5 years ago. I get pretty habitual when I find a dish I like, and, for years, I ordered their samosa chaat every time I’ve gone. 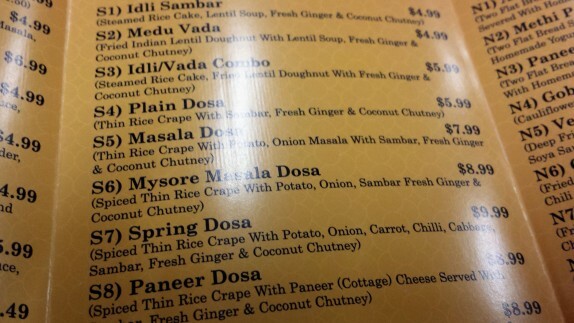 One thing I’ve always wanted to try there was the masala dosa. 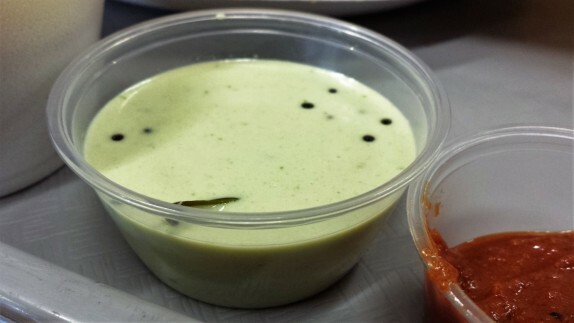 The dish at Parivar is very similar to the more upscale Karavalli, and at $1 more (ok, 99 cents, you stickler), my expectations for the taste were pretty high, considering the presentation is a bit more humble, let’s say. And I wasn’t disappointed at all. Pretty much everything about the dosa at Parivar blows Karavalli out of the water, and that’s no small feat considering how great Karavalli is. In a general sense, the flavor development from the spices is more profound at Parivar. This is true in the potato based filling of the crepe, which, at Parivar, takes on more of a mashed potato consistency. The mustard seed and curry leaves really help to amplify the potato taste and bring their own flavors. The tomato chutney is thick, almost like canned tomato paste, but much tangier, like it’s spiked with an ungodly amount of ginger. 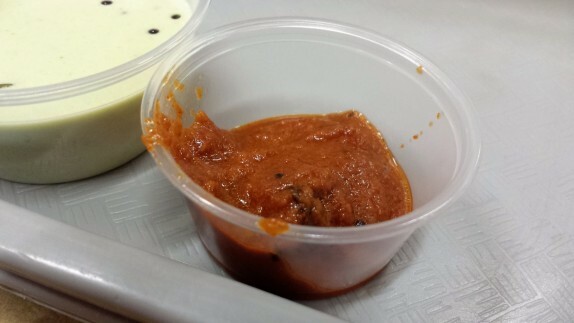 The coconut chutney is much more palatable at Parivar. It’s very smooth, and has a very clean coconut taste. 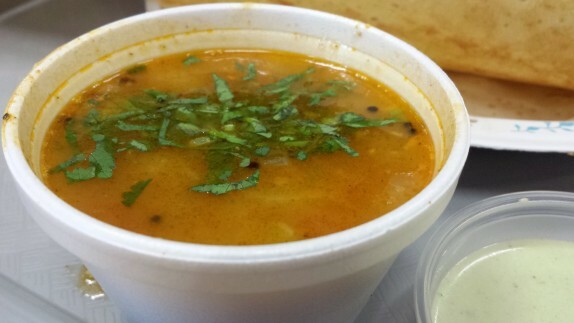 The fresh herbs in the sambar make this very fragrant. I’m not terribly keen on dipping the crispy crepe in the soup, so I eat it with a spoon, and dip little tears of the dosa and filling in the chutneys. The day I went, a couple of my co-workers from India were there having lunch and they further blew my mind. 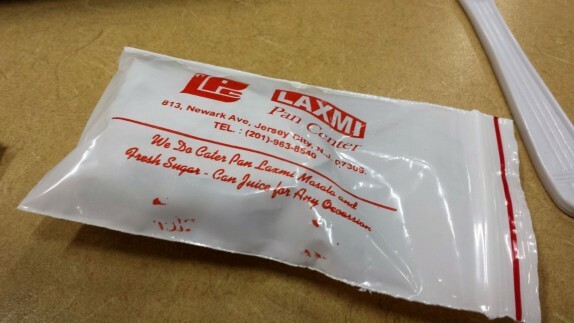 After they ate, they went back up to the counter and were handed a small white package, about the size of a pack of gum. After they ingested the contents, they stopped by my table to say hi; I was compelled to ask about the mysterious thing they ate. They treated me to one. It’s called Pan Masala, and it’s a common thing that people partake in after a meal hefty in Indian spices. Inside of the ominous white packaging, there was what looked like a ball of foil. And inside that, there was a green leaf folded up like one of those paper footballs we used to flick around in 2nd grade. And inside of that was a mixture of Indian spices. You’re supposed to chew everything together and either spit out the leaf (which could be a tobacco leaf) or swallow it. They watched me eat it and then told me I could have spit it out without being considered rude. Oh well. The flavor of this thing was unlike anything I’ve ever tasted. It was sweet, had a slight numbing effect, and had so many different flavors, it made the whole experience impossible to describe. It does have the taste of those little sugar coated anise seeds most Indian places have on the way out, and its intent is to aid in digestion just like the anise seeds, but it’s way more flavorful. I don’t think they carry the pan masala all the time, and I don’t know that I’d even get it every time. I have no idea how much it even costs! But I learned something. So… you order way in the back? I was in there once and I was honestly confused. But also, I’m easily overwhelmed with too much visual stimulation and that place is PACKED with stuff so it was probably my own “OMG TOO MUCH IS HAPPENING” in my brain. So.. any tips on HOW to order (yes, I know that sounds stupid) would be great. 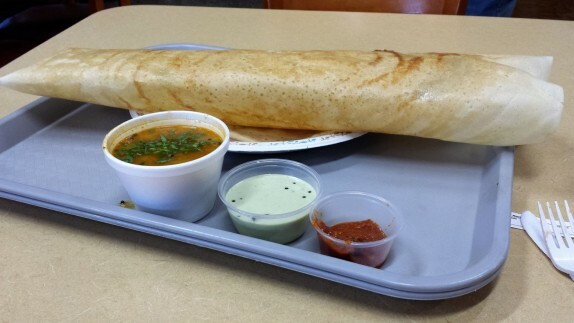 Because that dosa looks to be as big as my head. Part of the reason I’ve stuck to my usual Samosa Chaat for so long is because I’ve found that there’s quite a bit of a language barrier. As I’ve been eating at more Indian and Pakistani restaurants, I’m getting more familiar with the names of the dishes, but other times, I’ll just grab a menu, find something that sounds good and google it on the spot. There’s a little deli counter in the back where you order. The way it works is a little weird, after you eat, they hand you a slip and you take it to the front at the grocery checkout to pay. It’s unorthodox as far as what we’re used to, but sometimes those little idiosyncrasies make the experience unique. @Pirate Jeni : I went there a little while ago and was just as confused as you! I ended up just asking the lady at the counter for whatever she liked to eat, and enough for two people. We got a few great dishes, but yea there is a bit of a language barrier. 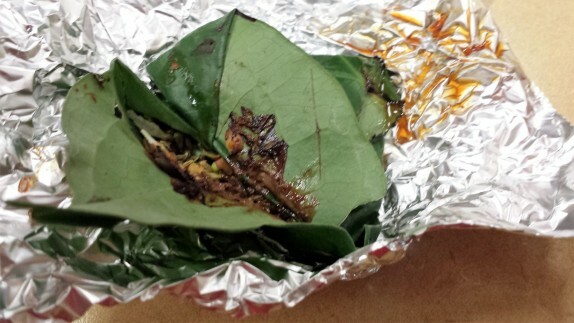 Paan does not contain tobacco, at least not here in the US (or else it would be explicitly conveyed). 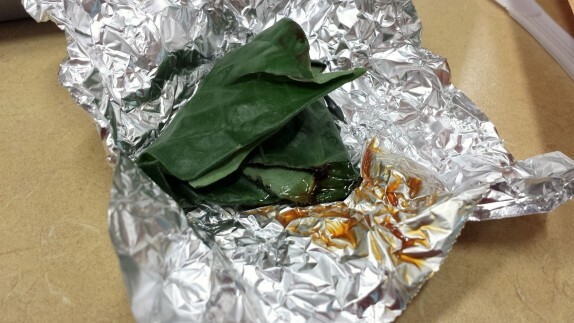 The leaf used is not tobacco, but the betel leaf–used for various reasons. The ubiquitous seeds used as a mouth freshener, palate cleanser, and digestion aid is not anise, but rather fennel seeds, or saunf in Hindi. The menu is not difficult to understand once you notice how it’s organized. The chaats are basically street food and are easily customizable, like salads. The South Indian fare is broken down into 3 types of dishes: idlis and vadas, dosas, and uttapams (also easily customizable). These three are served with the same chutneys and sambhar. Idlis are steamed, fluffy discs made of fermented and ground rice and lentils. Vadas are doughnut-shaped fritters that are fermented, spiced and fried, also made of ground rice and lentils. Dosas are made of the same batter that idlis are, but made on flat griddle in the shape of a really large and thin pancake. 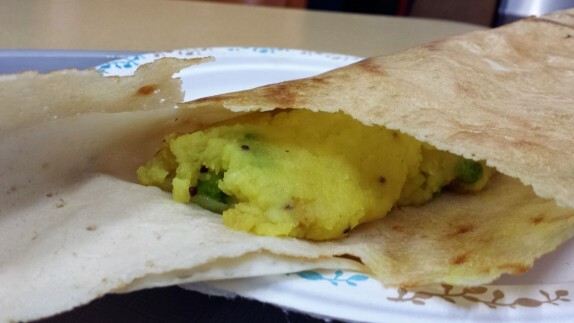 Uttapams are also made like dosas, but smaller and thicker pancake topped with vegetables and served open-faced.